Discussion in 'Pumps and Tanks Well Forum & Blog. Water is life.' started by alg, Nov 12, 2018. We do not have a private well, but are on a co-op well with 20 others, and the pressure is only 15PSI on a good day. Have a pressure booster system comprised of a 250gal tank, pressure tank, and a Goulds jet pump. Uses a pumptrol pressure switch adjusted to 30 to 50 PSI. Problem is that the check valve between the pump and the water tank will only last about 5 months and then stop holding pressure. The last check valve I used was a stainless steel Bonomi. After 6 months it would only hold 40PSI. Water would seem to be pushed by the valve and back towards the tank. Have 1 inch PVC from tank to pump with two 90-degree bends. Total length of pipe from tank to pump is 4 feet. Have moved check valve from the ends and the middle of the pipe and no matter where it is placed, it will fail within 6 months. The inexpensive brass check valves at Home Depot do not work at all. I assume the problem is not the check valves, but something else about my setup. Usually the only thing that causes a check valve to fail is the pump cycling on and off too much. But with a 250 gallon pressure tank, that should not be a problem. How often does the pump kick on and off? I would try the check valve on the input to the pump. I understand the thought of putting the check valve on the pump output, but that does not seem to be the way it is commonly done. Shouldn't make much difference to the check valve if installed on the suction or discharge side of the pump. I think you just got some bad check valves. How is the check valve failing? Does the spring break? Does the seat get pitted? Is there debris holding it open? If you remove the supposedly bad check valve, can you bench test it with air? It would help to know what the valves symptoms are. Thank you to everyone for the info. 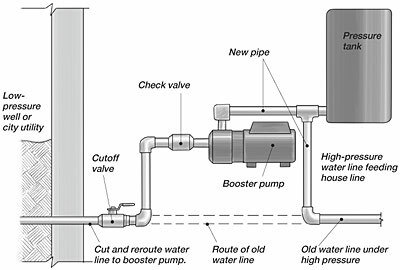 Water flows out of the tank via 1" PVC and passes through a check valve and then to the jet pump. The jet pump has a pressure range of 30 to 50PSI. After the pump is a 25-gallon pressure tank, which is set to 25 PSI and holding. When the check valve fails I can find nothing wrong with it. Suppose it is possible that there was debris in the valve which could come out during disassembly. If I put the bad valve(s) back in, they immediately leak the same way. That is, when the Bonomi failed it would only hold 40PSI. Took it out and later tried it again and it failed in the exact same way. Was wondering if any of the fittings on the pump may allow air into the housing, even though nothing is leaking from the outside? Also wondering if the check valve should be father from the pump than 2 to 3 feet? I still think that is just not a good check valve. I don't see anything wrong with the set-up. A 25 gallon pressure tank only holds about 6 gallons of water, so the pump is cycling a lot. But even that shouldn't take a check out so quickly. And no, air will not mess with a check valve. If you had air in it the pump wouldn't work, but the check valve would. Share my experience with Check Valve installation. I installed a Check Valave before the tank. It cause the pump not able to fully pressurize the tank and the pump just keep clicking and pumping none stop. I though was the pump or water tank problem. I replaced three pumps and 1 water tank...eventually I remove the check out then everything work perfect. I don't think there is a need of check valve before the tank. Just my opinion.